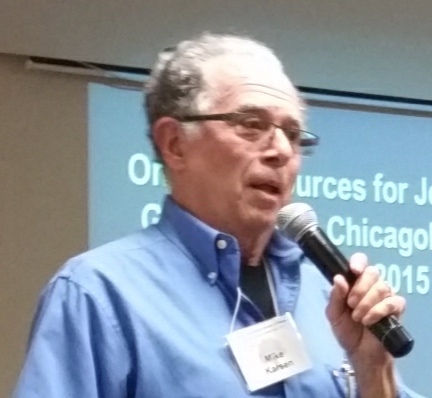 “Resources for Jewish Genealogy in Chicagoland—What’s New” will be the topic of a presentation by genealogist Mike Karsen at the Sunday, Nov. 18, 2018, meeting of the Jewish Genealogical Society of Illinois. His presentation will begin at 2 p.m. at Temple Beth-El, 3610 Dundee Road, Northbrook, Ill.
Mike Karsen will deliver his annual update covering various resources available to discover your Jewish roots in Chicagoland. He will include a wide range of records and research resources, including cemeteries, death certificates, death notices/obits, marriage records, birth records, and city directories. How to locate your ancestor’s naturalization records, which are essential for any genealogical researcher, will also be covered along with some uniquely Jewish resources. Today, with so many records available online, you hardly have to leave your home to research your Chicago roots. Case studies will be utilized to demonstrate the research process. A professional speaker, Mike Karsen is a member of the Association of Professional Genealogists and the Genealogical Speakers Guild, and is a past president of the Jewish Genealogical Society of Illinois. He has presented over 300 talks on genealogy topics locally, nationally, and internationally, including for the Newberry Library and the Spertus Institute for Jewish Learning and Leadership in Chicago. Mike is the author of the JewishGen website “Guide to Jewish Genealogy in Chicagoland” and has published articles on genealogy.